The Rock returned to WWE RAW tonight to respond to the John Cena rap last week. 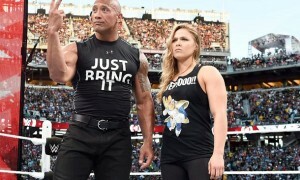 Taking a page out of the TNA playbook, The Rock and Cena have taken their war to the world of social media and continue to hype the most anticipated WrestleMania match in five years that won’t be taking place at #27. The return of The Rock is one of the most fascinating stories of the last several years. There is no doubt that The Rock has revitalized WWE business with a huge increase in RAW ratings and fan interest across the board in WrestleMania. The downside in all of this is that you now have an audience of millions buzzing about a match that has no chance of taking of place in the near future. There are a lot of false promises and innuendo being pushed that won’t be paying off for an audience that could turn angry when they realize they have been duped. Don’t get me wrong, I am just as excited as the next guy to see The Rock back in the WWE. The Rock’s return promo was the best promo I have seen cut in wrestling since well, the last time The Rock appeared on television which was the SmackDown 10th anniversary special. The immediate returns have been awesome with RAW generating a 3.9 rating last week along with a huge buzz online about The Rock and WrestleMania. Unfortunately there is a dangerous game being played here because for one, The Rock promised never to go away and well, he is going to go away fairly soon. Two, The Miz and the WWE title appear to be an afterthought to John Cena in favor of The Rock who will not be wrestling at WrestleMania 27. The payoff will appear to be big short term business but is anyone really sticking around at this point to see the Cena vs. Miz rematches after the Rock departs following WrestleMania 27? The other interesting thing here is that the WWE appear to be missing some big opportunities at promoting The Rock’s RAW appearances. The Rock was never officially promoted to appear on RAW two weeks ago, thus costing the WWE a huge potential audience. A big audience tuned in last week to see The Rock who didn’t appear. Over the weekend John Cena and The Rock teased a Rock appearance through social media. There was no advertisement last week at all on RAW that The Rock would be on tonight nor was anything mentioned until Sunday on John Cena’s Twitter account. These are the same kind of mistakes that fans and media have been ridiculing Dixie Carter and TNA for over the last year and now you have the WWE doing the same thing. The buzz started Sunday when John Cena posted the following tweet on his Twitter account. Cena than posted a new message this morning in response to a fan. So regardless of the questionable promotion it is a real fun time right now to be a wrestling fan. The Rock vs. John Cena is certainly the hottest feud in pro wrestling in the last five years at least. The Rock has told friends and media that he will never wrestle again following an injury on a movie set. 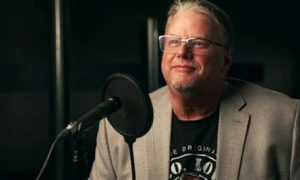 However, there is something said about the lure of the crowd and the excitement surrounding his current return that could seduce him back in the ring. 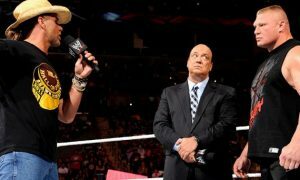 It won’t be WrestleMania 27 but there is certainly plenty on the table to start planning for a WrestleMania 28 showdown. In the meantime, John Cena vs. The Miz will have to do. Update: Here is the video from WWE RAW of The Rock responding to Cena!